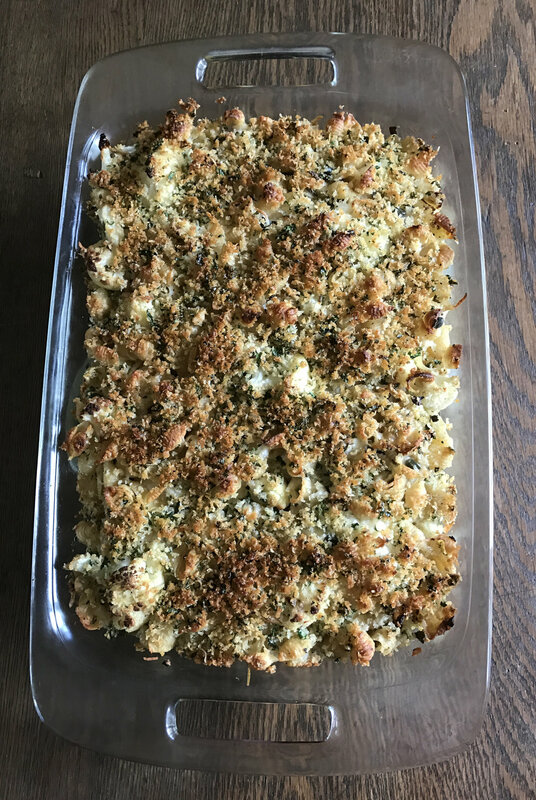 Crusty Baked Shells & Cauliflower — Good Food Makes Me Happy! This recipe is a great way to celebrate cauliflower! It's first sautéed in a hot pan, then combined with cooked pasta shells, fresh sage, a hint of lemon, and lots of cheese with a crunchy topping. Easy and delicious! Can be assembled up to 24 hours prior to baking, keep covered in the refrigerator. Fill a large saucepan with water, add 2 T. kosher salt and bring to a boil. Add the pasta and cook for 6 minutes (or according to package instructions). Drain and put in a large bowl. Add 3 T. olive oil and stir. Set aside. For the cauliflower, heat 3 T. olive oil in a large skillet over medium-high heat. Add the cauliflower in one layer and saute for 6 minutes, tossing occasionally, until lightly browned. Pour into the bowl with the pasta. Add the sage, capers, garlic, lemon zest, red pepper flakes, 1 tsp. salt and 1/2 tsp. pepper and mix well. Stir in the 2 cups of grated Fontina cheese. Transfer half of the mixture to a 10x13x2-inch rectangular baking dish. Mix the ricotta and creme fraiche in a small bowl, then spoon it over the pasta mixture, spreading somewhat evenly. Then add the rest of the pasta/cauliflower mixture on top. Combine the panko, Parmesan, parsley and 1-2 T. olive oil in a small bowl, and sprinkle it evenly on top of the casserole. Bake for 30 minutes.